A Miami mansion was recently being renovated. The contractor hired to do the job was making his way through one of the mansion’s bathrooms, slowly clearing debris and old walls. Suddenly, almost out of nowhere, he spotted something that looked out of place: a pile of USA currency – including packs of $5 and $20 Federal Reserve Notes – was situated behind the sink, appearing to be a long forgotten hoard of emergency cash from a former mansion owner. After the currency was removed, the home owner sold it to Marc Michaelson (www.highdenomination.com) and David Manley (www.thecurrencyhouse.com), two major Florida USA paper money dealers, specializing in high denomination notes. Later, the notes were slabbed by PCGS and made their way to eBay, offered by Jess Lipka (eBay userid: denoms), one of the most prolific note sellers online. Included in what was called the “Miami Mansion Hoard” were two sets of $10 silver certificate changeover pairs. PaperMoneyAuction.com was lucky to purchase both sets, one of which is featured below. A changeover pair occurs when two consecutively numbered notes from the same sheet have different series year marks or signatures. In the case of the notes listed below, one bears the series of 1934 marking with serial number A84119874A, while the very next note, numbered A84119875A, bears the series of 1934 A marking. 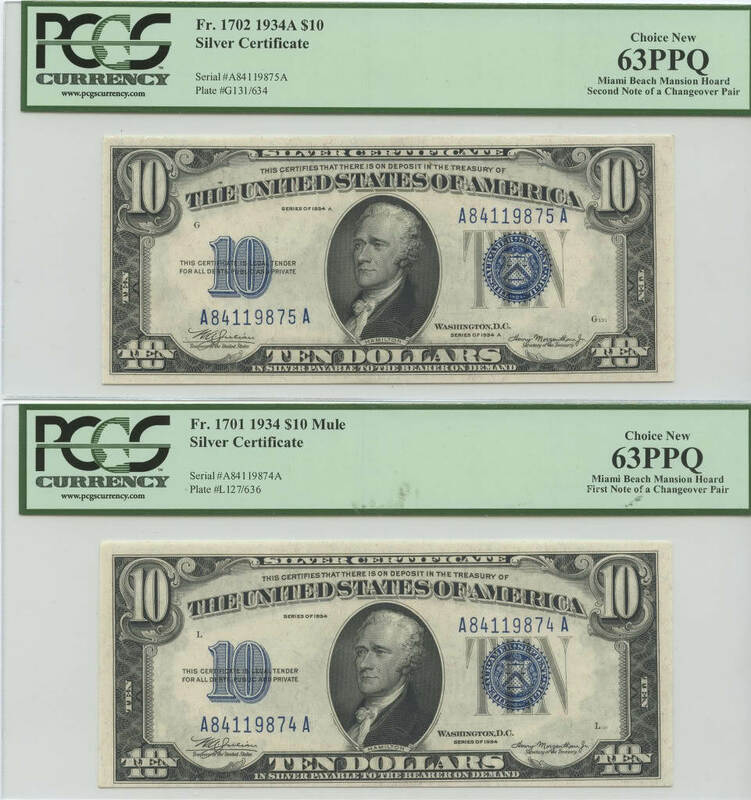 If separated and evaluated independent of one another, these notes would pass as good examples of $10 1934 / 1934 A silver certificate type notes, and nothing more. Together, however, their rarity is much more certain and quite surprising given the fact they were stashed behind a bathroom sink in a 1930’s Miami mansion. The mansion owner and contractor later split the proceeds from the sale to Michaelson and Manley 50/50. If you live in an old house, check your sinks! There could be any number of treasures waiting for you! We’ll happily entertain offers on these notes, but will probably not sell them unless the money is right. Write: support@papermoneyauction.com for more information. More about HighDenomination.com – www.highdenomination.com: Operated by Marc Michaelson, HighDenomination.com is one of the leading resellers of high denomination notes ($500-$1,000-$5,000-$10,000) in the USA. Michaelson offers a regular flow of great high denomination type notes, high denomination rarities, plus a solid selection of Gold Certificates from all denominations. More about TheCurrencyHouse.com – www.thecurrencyhouse.com: The Currency House is based in sunny Deltona Florida, run by noted high denomination expert David Manley. Manley offers a vast selection of $500 and $1000 notes, including gold certificates, type notes, and fancy serial numbered notes. Additionally, The Currency House sells rare and desirable $5,000 and $10,000 notes. Visit now and make an offer!